The full-length version is not yet complete and will hopefully be ready for publishing in mid-2018. The full-length version contains more detailed information about the method, as well as lots of stories, and examples, but the instruction manual is entirely sufficient to be able to apply the method effectively. This short, concise text will become your language learning reference book. To find out when the instruction manual will be published in paper form or to simply to find out what's happening with the Frictionless Mastery project, sign up for our mailing list. 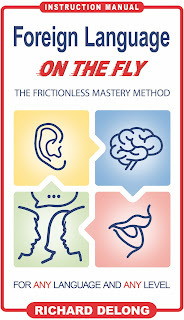 The Frictionless Mastery method delivers real-world results. It's for those who want to communicate with native speakers of a foreign language without wasting time on "study for study's sake." After all, so many language learners spend years in the classroom or in private study, but never really put their knowledge to use. Backward education practices aren't the only reason students fail to apply what they've learned. An ever-expanding array of electronic tools and resources, instead of facilitating fluency, often serves to distract and to overwhelm. The question everyone's asking is "which app should I use?" But trying to master a foreign language through software is about as effective as taking tango lessons on a website. Language learning is often ineffectual for internal reasons as well. Many students lack a compelling reason to speak a foreign language. Driven by external "carrots" and "sticks," they put forth a purely symbolic effort without creating any space in their lives for the language. Not so with frictionless language learning! The most obvious difference is that a frictionless learner actually uses the language for real-life communication. Interaction may be one-on-one or in a group, with native speakers or with fellow language learners, personal or business-related, face to face or online, in the form of sporadic meetings or continuous language immersion. The second thing that stands out is the frictionless learner's habit of jotting down notes during or after interactions in the language. What they write down is their own secret and doesn't disrupt the natural flow of conversation. One might assume that a frictionless learner also studies the language elsewhere, perhaps through classes, private lessons, or "teach yourself X" courses. However, this is rarely the case. Their "study" basically amounts to processing their own language notes—a task which takes up considerably less time than conversation itself. A frictionless learner might choose to enhance their self-instruction through pronunciation exercises, speech therapy, grammar study, films, books, podcasts, etc. However, these tools complement rather than substitute for live communication, which always remains the primary focus. 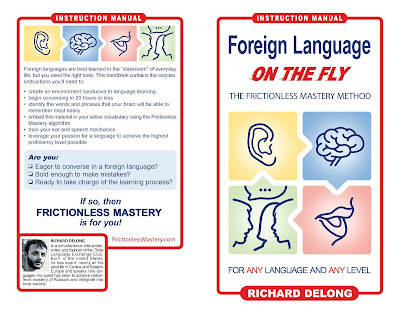 Because frictionless, on-the-fly learning is only possible once you've begun to apply your desired skill, the primary objective of the initial stage of language learning is to create a communication environment and begin speaking the foreign language as quickly as possible. 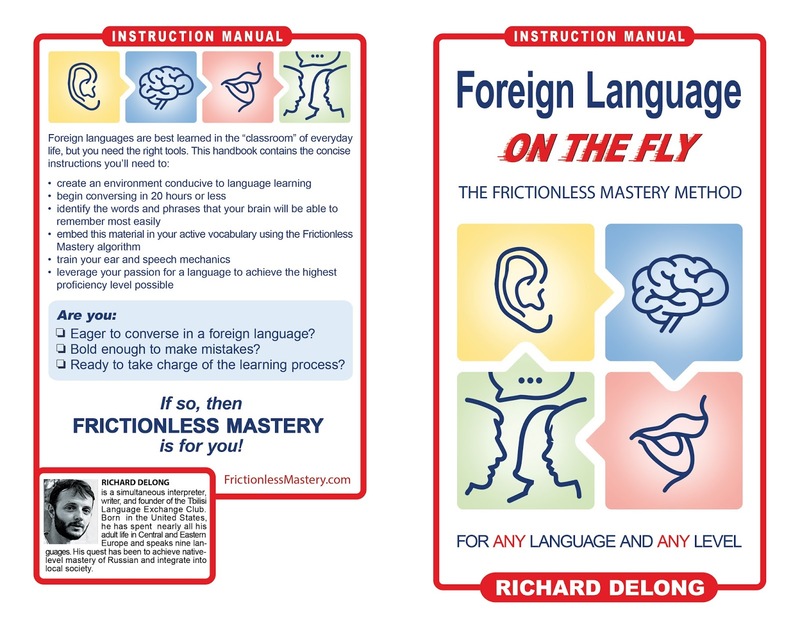 Frictionless Mastery is more than a method for learning languages: the principles can be used to acquire any complex skill or set of useful habits. Check out the reviews on Amazon (here are the reviews for the original version). 1. A full-length book describing my original methods, mindsets, and models, with stories, anecdotes, and thought-provoking ideas. — expected publication date: mid-2018. Sign up for notifications (no spam, I promise). CONTENT Contains everything that is in the instruction manual, but information is more spread out and arranged differently. 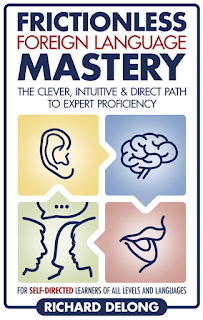 The book gradually builds a case for frictionless mastery. It shares stories, general principles, and specific recommendations along the way. 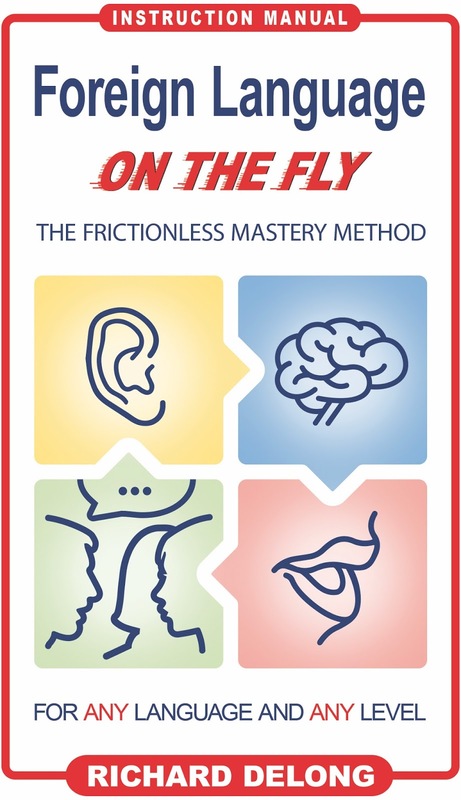 There is also discussion of how frictionless learning applies to any type of skill acquisition or lasting personal change. An action and understanding checklist is given at the end. Makes it extremely clear what you need to do, but provides almost no argumentation. Brief explanations are given for only the most important principles. The manual has no stories or entertainment value. Language is direct and concise, i.e. "do this," "don't do that." "It really expands upon, and goes into much deeper level of your method and how to apply it to your life. It's quite a good documentation of your philosophy I believe. As for things I liked, pretty much everything else you covered in the book was wonderfully written and presented very clearly. 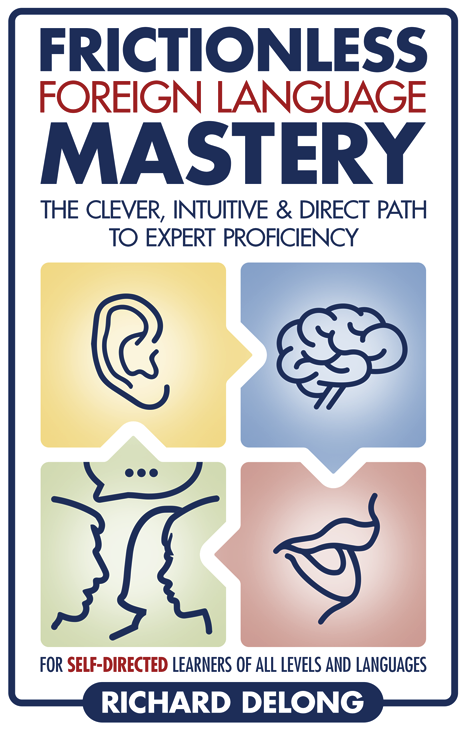 My main interest now came on the last few chapters, starting with Chapter 8, which deals with your training exercises, and how to improve your speaking and listening abilities. ...[This and the sections following outline] one of my biggest goals, to sound like a native speaker, gain acceptance from native speakers, and become "native" internally even though by birth I am American. So I plan to use them to their fullest extent in my learning. So thank you sir, for offering solutions to my biggest pursuit and barrier."